WASHINGTON (CNS) — During the weeks before Christmas, Catholic churches stand out for what they are missing. “The chance for us to be a little out of sync or a little countercultural is not a bad thing,” said Paulist Father Larry Rice, director of the University Catholic Center at the University of Texas at Austin. By the same token, he is not about to completely avoid listening to Christmas music until Dec. 24 either. The key is to experience that “being out of sync feeling in a way that is helpful and teaches us something about our faith,” he told Catholic News Service. Others find with the frenetic pace of the Christmas season it is calming to go into an undecorated church and sing more somber hymns like “O Come, O Come, Emmanuel.” But that shouldn’t be the only draw, noted Jesuit Father Bruce Morrill, who is the Edward A. Malloy professor of Catholic studies at Vanderbilt University Divinity School in Nashville, Tennessee. He said the dissonance between how the church and society at large celebrate Christmas is that the church celebration begins, not ends, Dec. 25. The shopping season and Christian church calendar overlap, but don’t connect, he added. And even though Catholic churches — in liturgies at least — steer clear of Christmas carols during Advent and keep their decorations to a minimum, Father Morrill said he isn’t about to advise Catholic families to do the same. He remembers a family on the street in Maine where he grew up who didn’t put their Christmas decorations up until Dec. 24 and didn’t take them down until Candlemas, commemorating the presentation of Jesus in the temple, which is celebrated Feb. 2 — the 40th day of the Christmas season. He is pretty sure that family’s children or grandchildren aren’t keeping up that tradition. Father Rice similarly doesn’t give families a lot of advice on when to do Christmas decorating, but when he has been pressed on it, he said, he has advised families to do it in stages — such as put up the tree and have simple decorations on it and then add to this on Christmas Eve. It’s a joyful time, he said, which Catholics should tap into. Celebrating Advent is a little tricky in campus ministry, he noted, since the church’s quiet, reflective period comes at the same time as students are frantic over exams, papers and Christmas preparations. This year, the day before the start of Advent, he said students planned to gather to decorate the Catholic center with purple altar cloths, pine garlands and some white lights. As Father Morrill sees it, decorating churches with white lights or greenery almost bridges the secular and religious celebrations of Christmas and that’s OK by him. 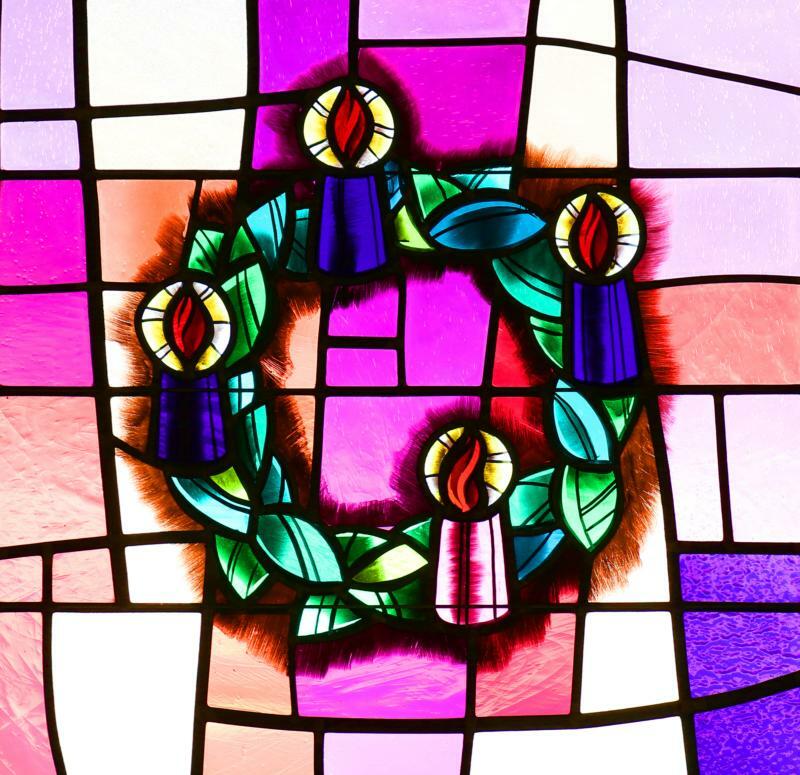 It beats using blue instead of purple for Advent wreaths or liturgical vestments, which he said some parishes did in the ’80s, until church leaders came down on it. Liturgical notes for Advent posted online by the U.S. Conference of Catholic Bishops — http://www.usccb.org/prayer-and-worship/liturgical-year/advent — points out that the liturgical color for Advent is purple, just like Lent — as both are seasons that prepare us for great feast days. It also points out that floral decorations should be “marked by a moderation” as should the use of the organ and other musical instruments during Advent Masses. The way the church celebrates Advent is nothing new. Timothy Brunk, a Villanova University associate professor in theology and religious studies, said it began in the fourth century in Europe but has never had the history or significance of Easter for the church. But even though Advent doesn’t have the penitential pull of Lent — where people give something up for 40 days or do something extra — that doesn’t mean the season should slip by without opportunities for spiritual growth. Father Rice said it’s important for Catholics to engage in spiritual preparation for Christmas even in the middle of all the other preparations. His advice: When you write a Christmas card, say a prayer for that person; while shopping, try to go about it in a slow and thoughtful way, not frantically running around, and let someone take that parking space you were eyeing. Those actions, he said, are modern works of mercy on a simple and immediate level. They also don’t require batteries or store coupons.